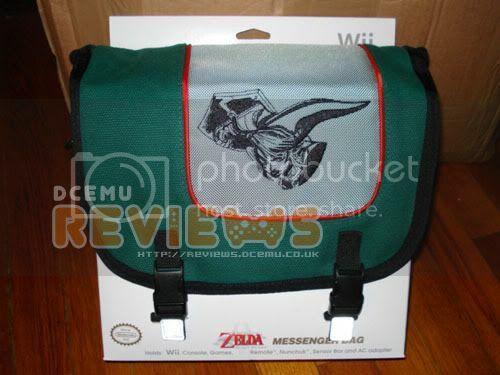 Overview : The Legend of Zelda Wii Messenger Bag (Z180) is an official Nintendo licensed product. It can hold Wii Console, games, Wii remote, Nunchuk, Wii sensor bar and AC Adapter. Official licensed product. Quality/Usability : The Nintendo Wii is the smallest console amongst the next-gen consoles (PlayStation 3 and Xbox 360). With the Nintendo Wii still hard to find in stores (Yes, even after a little more than a year of being released in the US, its still hard to find on store shelves), I had to bring my Wii to relatives house so we can all enjoy the family fun. Isnt that Nintendo's intentions? As the name of the product/review states, the messenger bag has a Legend of Zelda theme to it. The flap has an a stitched image of Zelda and underneath is Zelda's shield made of hard rubber. The messenger bag has three compartments and two elastic mesh side pockets. The two elastic mesh pockets can hold your cables or the other small accessories such as extra Wiimotes. The flap has two clips to keep the flap closed and underneath the flap are two velcro strips that attaches to the bag. Also under the flap but above the main compartment is a small mesh pouch. This mesh pouch is for the sensor bar. Unfortunately, if you have a wireless sensor bar, it wont fit as they usually tend to be bigger and thicker. This is actually the first carry case or that I know of that has its own pocket for the sensor bar. The main compartment holds the Nintendo Wii console. The compartment holds the Wii securely in place and has a lot of padding to give that extra protection. Inside the main compartment, is another compartment. This compartment allows you to hold two Wiimotes and AC adapter. There are even three elastic bands to hold them in place. The front pocket lets you hold Nunchuks, Wii games and any other controllers or accessories you may need to carry such as classic controller, GameCube controllers, etc. Conclusion : Overall, the Legend of Zelda Wii Messenger Bag is a well constructed bag. Even with all the pockets and compartments filled, the bag isnt too big compared to some carry cases on the market. Most cases on the market can only hold the system, cables, power supply and 1-2 controllers. This doesnt even include the sensor bar. While the Zelda bag can carry everything and then some. The images on ConsoleShop can be a little misleading as what I received (see image at top or attached) is not what is pictured on the site even though the images on the site is on the package itself. The image on the site is slightly different and the size of the bag looks like a regular normal messenger bag when the bag I received is smaller and almost the size of the Wii. The mesh pockets arent brown. They are black. The price isnt attractive at a very pricey $54.95 for a carry case. But if I had a choice of the Legend of Zelda Wii Messenger Bag or any of the 3rd party carry bags on the market, I'll choose the Zelda Messenger Bag as it offers more protection and it can store more. Guests online: 411. Total online: 413.